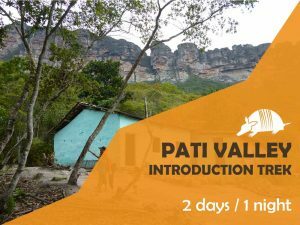 Tatu na Trilha” is a local ecotourism agency that caters for both Brazilian and English-speaking clients and is certified by the Brazilian Technical Standards Organization (ABNT) to operate trekking/hiking tours in the national park. 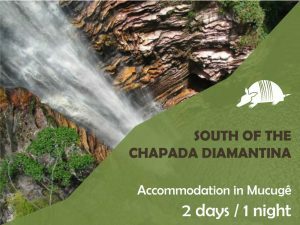 The selected tours have been designed to guarantee you a rich and rewarding experience within the wonderful natural landscape, flora and fauna of the Chapada Diamantina National Park. The Director of the Agency and INSA Engineer, Claude Samuel, served as Vice-Chair of the National Park Advisory Board and has been living in Brazil for over twenty years. A comfortable express bus will take you from Salvador to either Lençois or on to Palmeiras, where a shuttle to Capão will drop you in the village in front of the Tatu Feliz pousada. See item transportation for more details. A trekking tour to Pati Valley leaving from Capão. A physically active trek, involving two nights lodging in a valley resident’s house within the National Park. Luggage can be left at the agency during the tour. 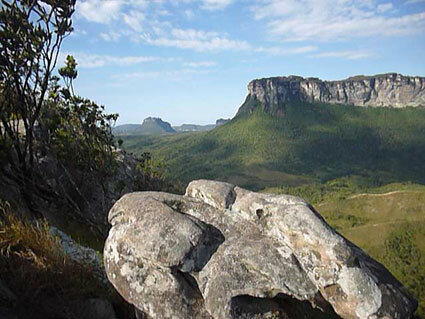 “Discovering Chapada” day trips involve trekking in the day and returning each evening to your lodging in either Lençois or Capão. 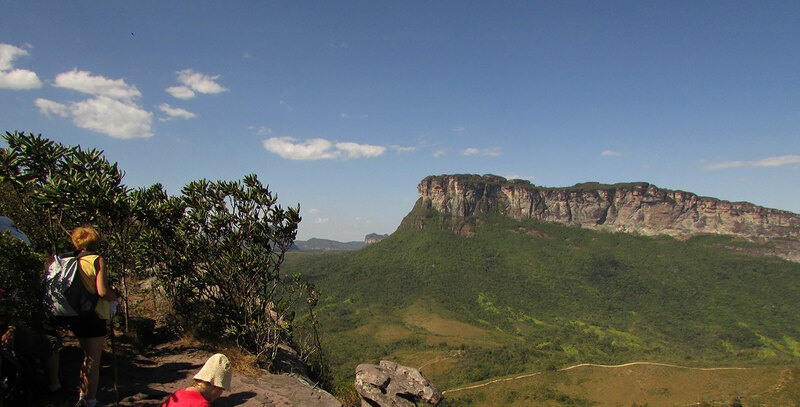 A diverse tour of the southern Chapada region staying in the beautiful town of Mucugê. A combo trip from the mountains of the Chapada to the beach at Diogo, 50 miles up the coast from Salvador. 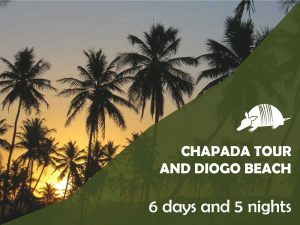 Choose one of the Chapada tour options followed by chill-out time on the beach, staying in Diogo village. A six-day option for a real taste of Bahia. 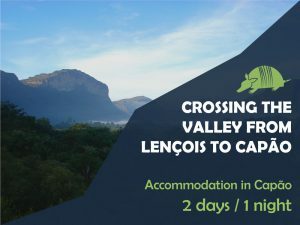 A two-day trek crossing the valley from Lençois to Capão, including the Fumaça Waterfall. Lodging is in Capão. Your reservation is confirmed upon payment of a deposit of 50% of the value of your tour with the balance paid at the agency. Price includes:English speaking guide, 3-day trek; 2 nights in homestay accommodation with breakfast and dinner; 3 picnic lunches; Ecotrip accident insurance; two-way transfer between the village of Capão and the start of the trek. Note that luggage can be left at the agency during the trek. It is requested that you arrive in Capão the day before the departure of the trek in order to undergo a briefing with your guide and run through safety procedures and national park guidelines. Price of accommodation at Pousada Tatu Feliz. Price includes: local transportation, English speaking guide, 1 night in homestay accommodation, accident insurance and meals (except dinner on day 2). Possibility of arrival the morning of the departure (bus leaving at 23.00 from Salvador the previous day). Briefing on site. Price includes: local transportation, English speaking guide, entrance fees on site, picnic lunche. Price includes: english speaking guide, two nights’ accommodation with breakfast, 2 picnic lunches for day 1 and 3, lunch at restaurant on the second day, excursions mentioned by car or on foot, entrance fees on sites, accident insurance. Excludes dinner and drinks. The agency vehicle picks you up at your hotel/pousada. 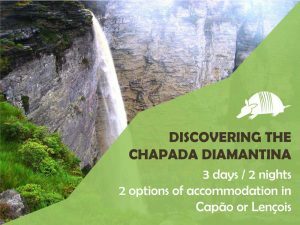 Price includes: english speaking guide, two nights’ accommodation with breakfast, picnic at the Fumaça, lunch at the restaurant by the caves, excursions mentioned by car or on foot, entrance fees on sites, accident insurance. Excludes lunch on the first day as well as dinner and drinks. Price includes:vehicle plus English speaking guide + site entrance fees, accident insurance and 1 night accommodation. Excludes lunches, dinner and drinks. 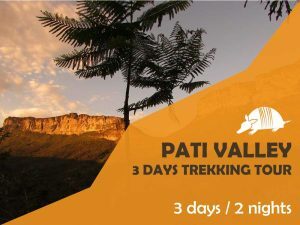 Price includes: Chapada Tour + bus tickets Between Chapada and Salvador, taxi between Salvador and Diogo and 2 nights at the Pousada Too Cool. Price includes: English speaking guide, internal transportation, picnic lunch on both days, accident insurance, 1 night in Capão and return to Lençois by shared taxi + bus. Looking for accomodation in Capão Valley? Have a look at Pousada Tatu Feliz’s rooms. Identification of risks for all co-workers and clients to minimize the possibility of accidents. Respect for the standards established by the National Park specifications. Particular attention is given to waterways that are traversed during the tours. Respect for the existing environmental legislation. Bus terminal of Salvador, destination Seabra, stop at Palmeiras. Capão valley, 50 km from Lençois, was a long time strategic base for diamond researchers working in the surrounding mountains between 1860 and 1930. The end of the diamond cycle saw the emergence of an economy based on coffee and banana plantations. The 1980s, which saw the arrival of people from larger Brazilian cities looking for a life closer to nature, has gradually transformed the valley. Several communities working with small scale farming and seeking a spirituality linked to nature blossomed whereas the 1990s brought tourism and new opportunities for all the residents. These communities successfully proposed courses of all kinds, ranging from natural medicine to shamanic retreats. Coupled with this a wider community movement is currently working on a sustainable development model that allows for the growth of the local economy while preserving the ecological and social balance of the valley. The choir, the circus school run by a Frenchman and the theatre group liven up the evenings in the village. Many Brazilian, South American and European artists have chosen to live there, giving the village something of a Bohemian feel, an easy-going atmosphere in which several different languages ​​can be heard. The village of Caete-Açu has adapted to these changes without losing its identity and Capão Valley can today count on over two thousand inhabitants.